Hi Everyone!! Hope you have all had a lovely Easter and indulged yourself in lots of chocolate! I know I certainly have. I don't think I can even look at another mini egg again without feeling a bit sick. Oops. Definitely going to be heading to the gym everyday for the next couple of weeks! But anyway, enough about that! It has been literally ages since I last posted a proper beauty review but I really want to start getting back into it as I've been experimenting with lots of new products recently and I'm sure you all know that beauty was once the primary focus of my blog. If you saw my huge beauty haul post just over a week ago then you will know I bought a lot of make up and skincare bits and bobs so keep an eye out for a lot of reviews heading your way. 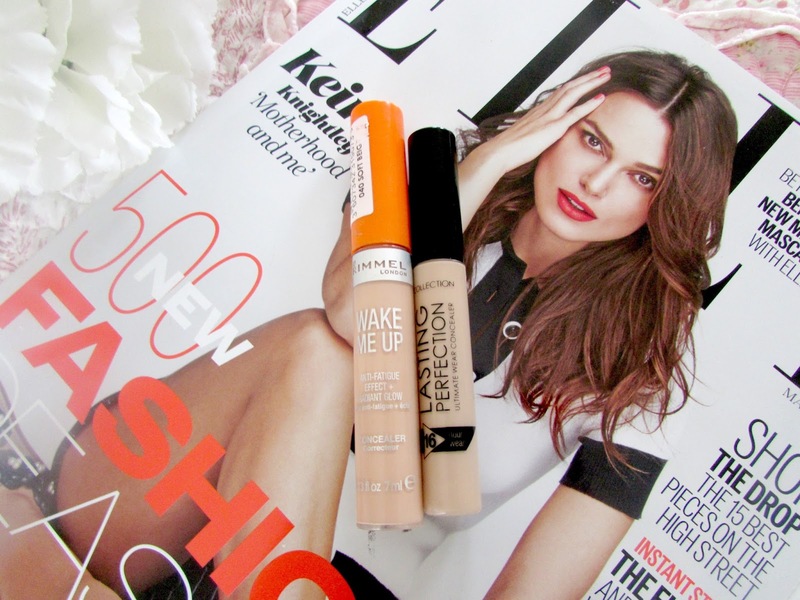 Today I thought I'd take about two of my favourite concealers right now. One of which you would have heard me rave about many a time before and the other which I tried and didn't get along with previously but now love! Keep reading to find out more. The first concealer that I've obviously been loving is the Collection Lasting Perfection Concealer which I'm sure you all know is extremely hyped up within the beauty community. I wear the shade Warm Medium (3) and I absolutely love it. I have definitely used this concealer to death but it's just amazing. The main aim of this concealer is to cover up flaws, blemishes and other imperfections for up to sixteen hours. Now I'm not going to lie here, I've never really timed it so I can't really comment on the time but I definitely agree with the fact that it covers up all my blemishes and other imperfections extremely well. It gives really high coverage and just does what I want it to do. 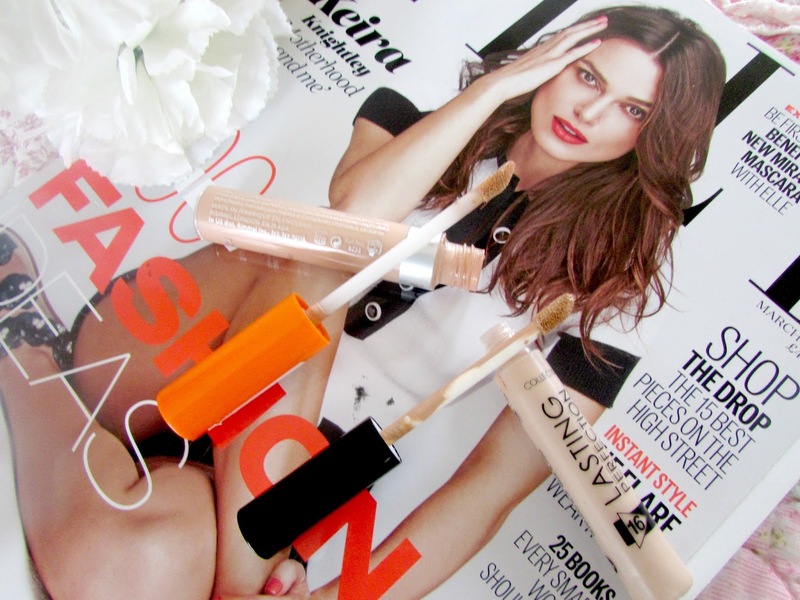 The Rimmel Wake Me Up Concealer is another concealer that I have been loving recently. However it wasn't always this way. For some reason I used to really struggle to like it. I just wasn't keen on it. I can't explain why because I really do not know. However now I absolutely love it. I wear the shade Soft Beige (040) but I very rarely use this on blemishes. Instead I use it to brighten underneath my eyes. I don't get much sleep and the bags under my eyes can be really awful however I find that this concealer solves that problem completely. It has such good coverage and it really does brighten the area really well. I love the fact that both of these concealers come with wands as I find it's so much easier to apply the concealer even if it's not the most hygienic. I tend to dab the concealer on the back of my hand before applying it to the designated areas with my fingers. I find the wands allow you to get the perfect amount of concealer without putting on too much and going over the top with it. I love that both of these tubes are such a good size! You can just pop them into your make up bag and you're good to go! Perfect for just touching up when you're out and about. If you read my previous review then you will know that when it came to the Collection packaging the wording very often rubbed off and stained my hands which I found extremely annoying. Sometimes I would end up with a black mark under my eyes when applying the concealer. Now I don't get any of that which makes the product practically perfect for me now. 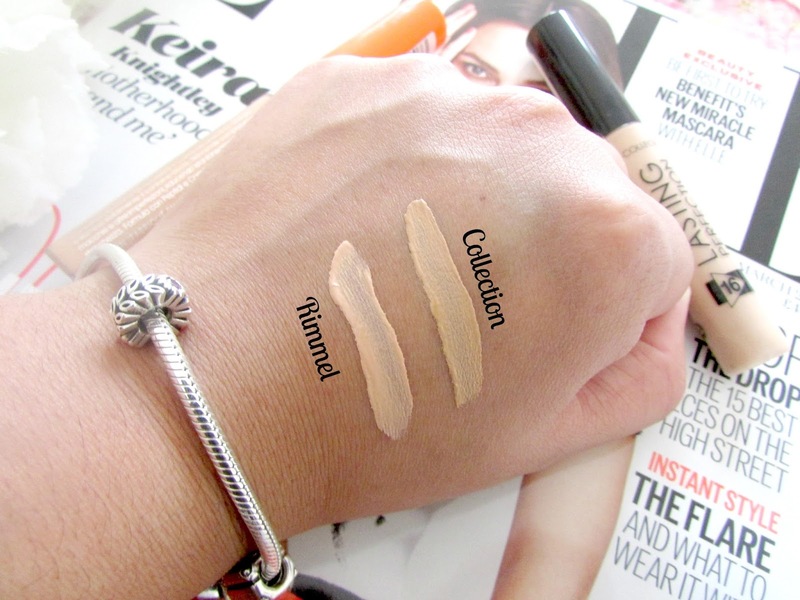 As you can see from the swatches above the Collection Lasting Perfecting Concealer is slightly darker than the Rimmel Wake Me Up one. This is purely because the Rimmel Wake Me Up Concealer brightens the area under my eyes a lot more. I find that using the collection one under my eyes doesn't really do a lot. It covers the dark circles but doesn't make the area that bright which is what I like. The Rimmel one is definitely the right shade for me when it comes to brightening the under eye area. It's lighter than my skin tone but not too light and just brightens the area perfectly. 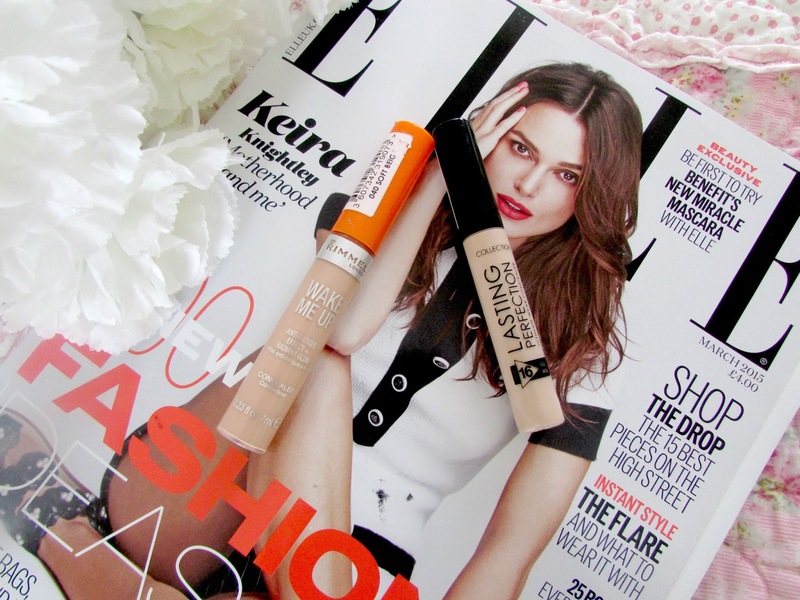 As you can tell I'm a huge fan of both these concealers and I would highly recommend them both. They are both super affordable too with the Collection Lasting Perfecting Concealer being around the £4 mark and the Rimmel Wake Me Up Concealer being around the £5 mark which I think is amazing. I do want to try some other drugstore concealers though so if you have any recommendations then please let me know in the comments below. What are your favourite drug store concealers or concealers in general? I've still not tried the Rimmel concealer but currently use Mac's Prep & Prime as a brightener (too pricey for day-to-day) so I will definitely give this one a go! I have both of these and I'm not a fan of the Collection one as I find it too drying and cake-y but I recently bought the Rimmel one and love it for brightening my undereyes! I've never tried the Rimmel one, but I am an avid lover of the Collection Lasting Perfection & have been for a verrrrrry long time! I am giving it a rest at the moment though for the new Urban Decay one, it's epic!! I always use the collection one =] Its my favourite and matches my skin perfectly.